Witnesses include an innocent victim of civil asset forfeiture, Russ Caswell, whose family's motel in Tewksbury, Massachusetts was wrongfully seized by the government in September 2009 because it had "facilitated" criminal activity. He was never charged with or convicted of a crime, but his motel, in the eyes of the government, was guilty. In civil asset forfeiture cases, the burden of proof rests on the property owner, meaning that Caswell had to fight the government in court to get back his motel, which he and his wife planned to sell to enhance their retirement. Caswell did fight the seizure, and he won, but it was a costly process. He had to borrow $60,000 to pay legal fees and his wife's health worsened during the more than three-year battle. Caswell feels that he was targeted because his $1+ million motel, which was paid off, was worth more than other similar properties in the area. After his unfortunate and unnecessary experience, he now calls civil asset forfeiture "legalized theft," and he's absolutely right. But his story is just one of many that shows the abuse of federal civil asset forfeiture laws and perverse profit motive often behind seizures. 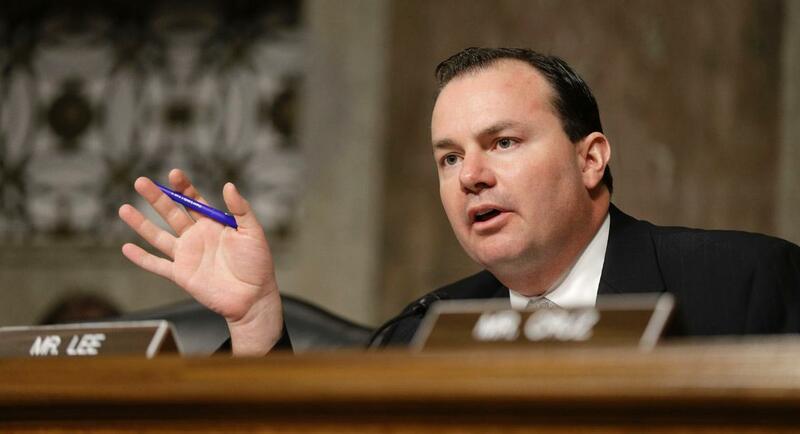 During the hearing, not long after Caswell told his story, Sen. Mike Lee (R-Utah) explained how federal civil asset forfeiture undermines basic constitutional principles. "The Constitution states that no person shall 'be deprived of life, liberty, or property, without due process of law.' Despite this protection, the testimony today and recent news reports suggest that due process is often ignored when it comes to civil asset forfeiture," he said. "While we all agree that crime should not pay, federal forfeiture laws have enabled and incentivized law enforcement practices that threaten our liberty." Lee's first round of questioning was primarily directed at Darpana Sheth, an attorney at the Institute for Justice, a libertarian public interest firm that assisted Caswell. The Utah conservative's line of inquiry demonstrated how the federal government, in 1985, began incentivizing state and local law enforcement to abuse civil asset forfeiture laws. The federal government will adopt property seized by state and local level and send up to 80 percent of the proceeds, known as "equitable sharing," back to them through the Justice Department's Asset Forfeiture Fund. "Before 1985, proceeds from civil forfeitures went to a general fund, where Congress had control over how that money was spent. But in 1985, the law was change to create the Asset Forfeiture Fund, giving the Justice Department direct control," Sheth told Lee. "Since that time, the funds have grown exponentially. In 1986, after the forfeiture fund was created, it was only $93.7 million in deposits. Twenty years later, annual deposits regularly top over $1 billion. And the same is true with the Treasury Forfeiture Fund." Sheth, who says administrative reforms announced by the Justice Department are inadequate, doesn't believe the explosion in of dollars in the federal asset forfeiture funds is coincidental. "I think there's a direct correlation," she said. "You know, it's a financial incentive, and people respond to incentives." Senate Judiciary Committee Chairman Chuck Grassley (R-Iowa) is working on legislation that would offer some fundamental civil asset forfeiture reforms. Though his bill is in the draft stage and hasn't been made public, Grassley offered some insight into how far he's willing to go to rein in abuse of federal law. "Civil asset forfeiture leads government to exceed its just powers over the governed. It encourages law enforcement to take short cuts. Rather than prosecute or even arrest, civil asset forfeiture enables law enforcement to seize property without any proof of wrongdoing. And the process creates perverse incentives," Grassley said in his opening statement. "When this occurs without pursuing a criminal conviction, or even an arrest, the chances rise that the rights of innocent people will be violated." In his disingenuous defense of federal civil asset forfeiture law, Chuck Canterbury, national president of the Fraternal Order of Police, noted that Grassley's draft bill would bring to an end the Justice Department's "equitable sharing" program, which has facilitated this brand of government overreach. The Iowa Republican, who's opposed other much-needed justice reforms, criticized Canterbury's testimony. "I am troubled that the FOP’s written testimony...dismisses the need for real reform and demonstrates the absurdity of a system of justice in which some in law enforcement appear to value funding their own operations over protecting civil rights," said Grassley. "No one in law enforcement has offered constructive legislative alternatives. I hope that will change. Legislation is necessary." Though Grassley, Lee, and several witnesses made a clear and compelling case for federal civil asset forfeiture reform. Not everyone on the committee was convinced, demonstrating that even though there is momentum on Capitol Hill, it will be a difficult process. Sen. Jeff Sessions (R-Ala.), for example, rejected any meaningful reform effort, ostensibly suggesting that the government can ignore the constitutional protections that Lee cited earlier in the hearing. There may be a long process ahead, but constitutional conservatives, like Lee, will continue to make the case and push for federal civil asset forfeiture reform, as will innocent victims like Russ Caswell. "[E]ven though I won my case, I will continue to fight for civil-forfeiture reform," Caswell told the committee. "I will do everything in my power to make sure that no other American has to endure what I did."